Just ignore our title, we are just having fun with the Gibbon Attacks incident at Zoo Melaka which happened last year. There was no such incident when we visited Zoo Melaka last year, you can see the pictures around Zoo Melaka here. But after the attack, it did come across out mind – Will people still visit Zoo Melaka after the animal attack? Well, Zoo Melaka is back to business as usual . Everything is back to normal. We went blog hopping, hoping to find other blogs that wrote about Zoo Melaka recently and we found Life-Muses.com. The blogger even said that Zoo Melaka is nicer that the National Zoo. That’s cool. Part of our Chinese New Year this year, we went down South to Malacca. This time we stayed a night so that the kiddos have more time to explore Malacca. Our first stop in Malacca before checking in is Malacca Zoo. I’ve been here once many many many many years before when they first opened and was impressed with it. Found it nicer than our National Zoo! You can visit Life-Muses.com post on Zoo Melaka through this link. 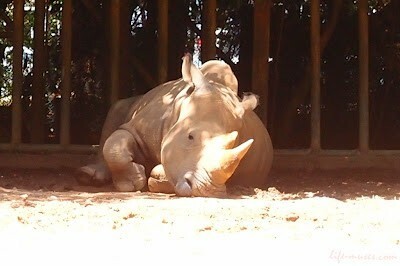 Below is a picture of a sleepy rhino 🙂 We didnt manage to do that during out visit. Saw your msg in my blog. Thanks for the link back. that rhino really does look sleepy.